This book caused loads of controversy apparently when it was published in Italy last year. Umberto treads ideas of conspiracy theories, which he first looked at in Foucault’s Pendulum. A return to form perhaps? The last thing I read by him was Baudalino, which I found indulgent and disappointing, but I loved The Name of the Rose and Foucault’s Pendulum. Nineteenth-century Europe—from Turin to Prague to Paris—abounds with the ghastly and the mysterious. Conspiracies rule history. Jesuits plot against Freemasons. Italian republicans strangle priests with their own intestines. French criminals plan bombings by day and celebrate Black Masses at night. Every nation has its own secret service, perpetrating forgeries, plots, and massacres. From the unification of Italy to the Paris Commune to the Dreyfus Affair to The Protocols of the Elders of Zion, Europe is in tumult and everyone needs a scapegoat. But what if, behind all of these conspiracies both real and imagined, lay one lone man? What if that evil genius created its most infamous document? Eco takes his readers on an unforgettable journey through the underbelly of world-shattering events. Eco at his most exciting, a book immediately hailed as a masterpiece. The nineteenth century teemed with mysterious and horrible events: the Protocols of the Elders of Zion, the notorious forgery that later inspired Hitler; the Dreyfus Case; and numerous intrigues involving the secret services of various nations, Masonic sects, Jesuit conspiracies, as well as other episodes that—were they not documented truths—would be difficult to believe. 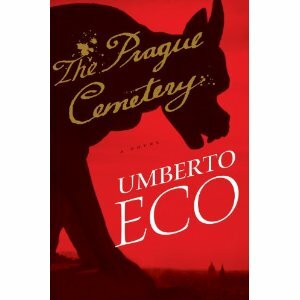 The Prague Cemetery is a story in which all the characters except one—the main character—really existed. Even the hero’s grandfather, the author of a mysterious actual letter that triggered modern anti- Semitism, is historical. And the hero himself, though fictional, is a personage who resembles many people we have all known, past and present. In the book, he serves as the author of diverse fabrications and plots against a backdrop of extraordinary coups de théâtre: sewers filled with corpses, ships that explode in the region of an erupting volcano, abbots stabbed to death, notaries with fake beards, hysterical female Satanists, the celebrants of black Masses, and so on. I am expecting two kinds of readers. The first has no idea that all these things really happened, knows nothing about nineteenth-century literature, and might even have taken Dan Brown seriously. He or she should gain a certain sadistic satisfaction from what will seem a perverse invention—including the main character, whom I have tried to make the most cynical and disagreeable in all the history of literature.